Dr Benjamin Hewitt specialises in knee conditions and treatments, including knee arthroscopy, ACL and ligament reconstruction, patello-femoral reconstruction, uni-compartmental knee replacement and total knee replacement. Arthroscopic surgery is a technique used to inspect the knee joint cavity to diagnose, assess and possibly treat any damage. It involves the use of a small fibre-optic telescope, video equipment and small instruments. Simple procedures such as the trimming of a torn meniscus, debridement of an arthritic joint or removal of loose fragments are possible. Click here to read more information about arthroscopic surgery. Click here to read The Australian Knee Society Guide. The ACL is responsible for controlling rotational stability of the knee. An ACL deficent knee is unstable for activities involving pivoting, twisting or deceleration and may give way. The deficient ligament is replaced with a graft usually either hamstrings ligament or patella tendon. The graft is placed in the knee joint through drill holes in the bone and held with screws. Click here to read more information on reconstructive surgeries. A unicompartmental knee replacement (UKR), also known as a partial knee replacement is designed to replace the worn surfaces of the knee joint. This is done using a metal and plastic device fitted onto the surfaces of the femur and tibia. Some bone is removed to allow the implant to fit correctly. The implant is fixed either with cement or by allowing bone to grow into it. For more information on uni-compartmental knee replacement surgery, click here. For more information on total knee replacement surgery, see the full page here. There are many exercises and stretches that need to be done after a major operation to help you to regain your strength and mobility. 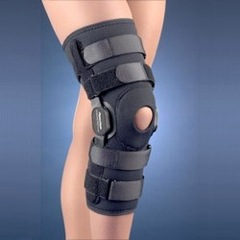 Our practice also stocks the commonly used knee and ankle braces. If required we will custom fit one to your particular requirements. For all the information you need, see Dr Benjamin’s full guide here.